Dr Stefan Hajkowicz, futures researcher for Australian national science agency CSIRO, highlights trends that will reshape the landscape for government, business and society in the next two decades. A megatrend is a gradual boil, says Dr Stefan Hajkowicz, Futures researcher for Australian national science agency CSIRO, referring to the classic tale of the frog who felt comfortable and warm, just before the water was about to boil. 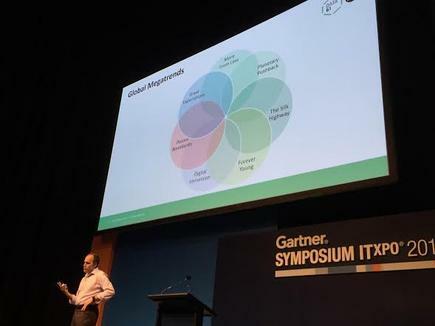 But it is not about getting boiled, it is knowing the opportunity and risk that lies ahead, says Hajkowicz, in his keynote at the 2015 Gartner Symposium/ITexpo in the Gold Coast. Quoting his new book Global Megatrends published by CSIRO, he points to seven shifts that will impact sectors in the next 20 years. More from less: Scarcity of food and water relative to demand. Planetary pushback: Biodiversity loss and climate change or the move to hotter and more variable climate. Silk highway: Changing world economy with bulk of output coming from China and India. Forever young: The ageing population and retiring later in life. Some people are never going to retire. If you don’t retire completely, you will have better mental and physical health, but it has to be the right connection to the workforce. For instance, not digging coal at age 70 but teaching the next generation of miners. Digital immersion: Growth and power of device and computer connectivity. Porous boundaries: Organisations are being restructured, with the emergence of peer to peer economy and growth of freelance and portfolio work. Great expectations: Switch in consumption from material goods to experiences or the rise (and continued rise) of the experience economy. Read more: Where is technology leading us?